As I move beyond the age where going to nightclubs remains comfortable, I find myself enjoying dinner parties more and more. I’m not talking about the Come Dine With Me style bitterness fests which we often see on TV, but instead those rare evenings when mutual disclosure is permissible and perhaps even nourishing. I apologize for writing about an arguably pretentious black and white French film, but I recently caught the wonderful ‘My Night With Maud’ for the first time. 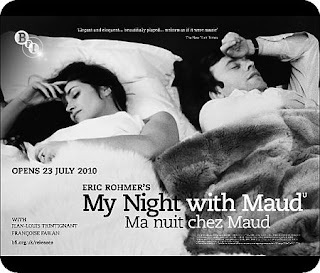 The film captures an intimate night in which a strongly Catholic man is introduced to a divorcee, the beguiling Maud. Over the course of the night they discuss fate, mortality, and philosophy, and when snow prevents him returning home the two of them have to spend the night together. As an engaged Catholic the man has to resist the charms of the alluring Maud, and question whether his wife-to-be, a younger and more innocent women, is really right for him. In so doing the two characters inner worlds, with all of their ornate details, are laid bare through their private conversations. The concept of two people attracted to one another and being bound together for a period of time is one that intrigues me. 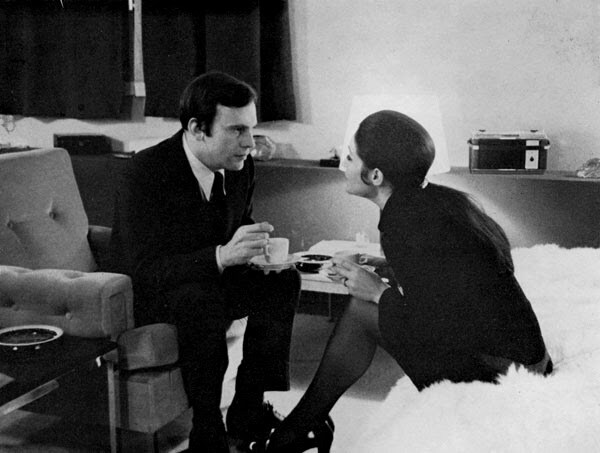 The film was one of my main inspirations when writing The Intimates, in which I wanted to examine why dinner parties allow people to so readily reveal themselves. What fascinated me about this film was the way in which the two characters late-night conversation allowed both of them to map out their intricate inner worlds. 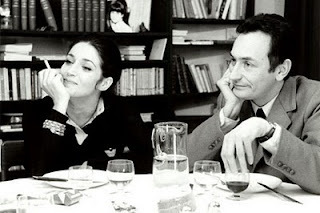 In striving to justify their worldview to one another – if only to resist each other - they created a bond which remained long after the man is forced to return to his fiancée. Despite this, it is evident that Maud, played by the exquisite Françoise Fabian, lingers in his mind. As a voyeuristic viewer you’re left to wish that he returns to her too. It confronts the viewer with occasions they have found themselves resisting temptation, and in so doing bonds us to the protagonist. The movie was the third in a sequence by six by Eric Rohmer, but out of all of them is undeniably the one that leaves the most enduring impression.